Have you ever stared into your wardrobe not knowing what clothes to put on? Then throw on the first thing you see and fly out the door. I often arrived into work with the wrong colour tights (navy under a black skirt) or went out wearing a top that was too short or too warm (polo neck on a summer’s day). Just like planning my food, I now organise my clothes the night before. This has made a huge difference to the way I look and the way I feel. I used to say things like, “I have nothing to wear”. The crazy thing is we all have wardrobes packed with clothes we forget we owned or that we’ve never worn. The Internet lists many ways to wear the clothes you have sitting in your wardrobe. So after checking out a few sites and magazines I have some tips I hope you like and I know that if you use one or two you will walk out the door looking amazing every time. Leave out the clothes you are going to wear tomorrow, before you hop into bed. This means you will start your day feeling nice and calm and maybe gain an extra 5 minutes in bed. 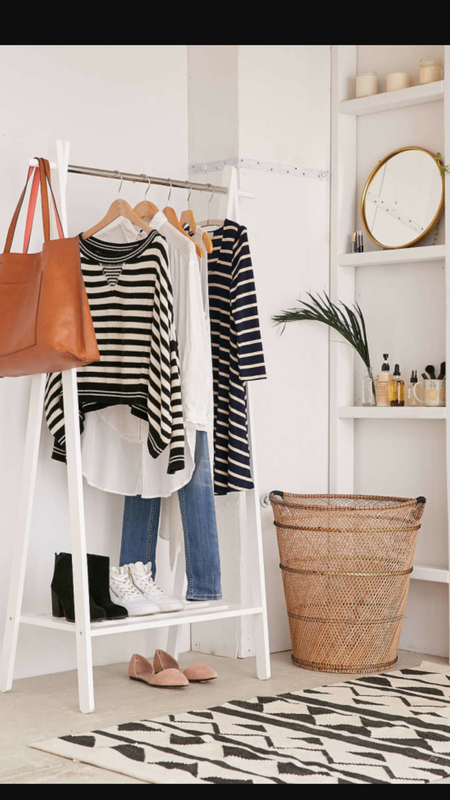 Organise a wardrobe capsule for casual days consisting of a few simple items, 1 or 2 pairs of jeans/trousers, 2 or 3 tops (long sleeved T), denim or white shirt, short cardigan, leather jacket and a blazer, pair of flats (converse or vans), pair of boots (flat and heels), a big hat, big bag and colourful scarf. (Statement pieces). Organise a wardrobe capsule for work, 2 x dresses, trousers, skirt, 1 or 2 tops, flats and heels. Organise your sock drawer. Odd pairs can always be worn inside your boots. Hang your jeans up so you can clearly see them. If you are stuck for space fold your jumpers and tops and leave on shelves. Don’t pile too high because the one you want will always be on the bottom. If you have an item that you no longer need or use, and it might be something someone else might need or use, then give it to them. It feels good — like good Karma. Keep similar colours together in your wardrobe. Wear a scarf or long necklace over a simple top. Buy yourself a scarf the same colour as your eyes. Makes your eyes shine brighter. Believe me these simple tips will make a difference. Try them and I guarantee you will wake up, dress up and take on the day like a queen. Excellent advice. Will certainly do this. I am always looking into the wardrobe saying I have nothing to wear.